This IBM® Redpaper™ publication is a comprehensive guide that covers the IBM Power System™ S822LC for High Performance Computing (HPC) server (8335-GTB model). The S822LC for HPC server is designed for high-performance computing applications that support the Linux operating system and high-performance data analytics, the enterprise data center, and accelerated cloud deployments. 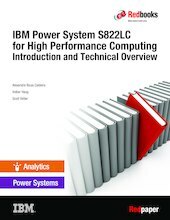 This paper expands the set of IBM Power Systems documentation by providing a desktop reference that offers a detailed technical description of the S822LC for HPC server.